When the novelist is suspected of autobiography, what is left for memoir? Marcel Proust said so much in his book that by the time accounts of the man himself were published, most delightfully by his maid, Céleste Albaret, they were concerned largely with what he had already written, and how. In his nine short novels and three miscellaneous prose texts, the Belgian Jean-Philippe Toussaint’s unnamed, first-person narrator sits in a bathroom, escapes to Venice, visits Japan and China, and fails to write a book in Berlin, but time is short, and little is confessed outside the bounds of the odd, spare narratives. English-speaking admirers of Toussaint’s jaunty, limpid prose might thus warm to the news of Edward Gauvin’s translation of 11 short essays by Toussaint on style, influence, and where he wrote his books. 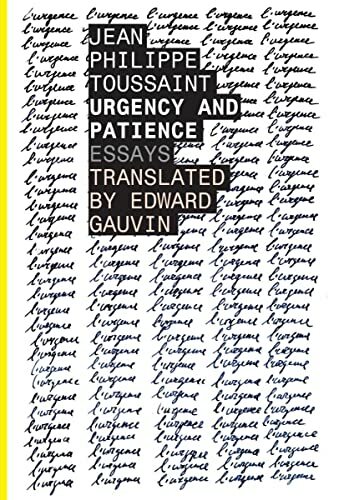 Recently released as Urgency and Patience: Essays by Dalkey Archive Press, one of the most cosmopolitan publishers of fiction in America, the essays were first collected in 2012 by the venerable Éditions de Minuit. As in his elliptical fictions, Toussaint’s recollections of the writer’s life tend to insinuate rather than disclose. We learn of his offices, of his first day of writing, and of how he met his publisher, Jérôme Lindon, and his hero, Samuel Beckett. It is a memoir only in the sense that the Essais are. Indeed, particularly in L’Urgence et la Patience, the prose is pure anti-Ciceronian. The signature long sentences — irregular, disjoint, apparently spontaneous — capture thought in action; quick, steely aphorisms underline the point. If Toussaint is often held up against Alain Robbe-Grillet, then Michel de Montaigne, Pierre Charron, and François La Mothe Le Vayer are not far behind. While the French of Toussaint’s L’Urgence et la Patience fairly glitters and flies, the English of Gauvin’s translation tends to normalize, even clot. To some extent the disappointment flows from Toussaint’s fastidious attention to sound. Toussaint relates in the eponymous “Urgency and Patience” (essay three) that he once went so far as to excise a description of a commode from The Truth About Marie because it added nothing to the “charming sonorities” of the word (“le bahut”) itself. Toussaint insists that readers “hear the word, not see the object”; translation has chiefly objects to give. Ici—au cœur même de l’urgence—, tout vient aisément, tout se libère et se lâche, la vision réelle ne nous est plus d’aucune utilité, mais l’œil interne se dilate et un monde fictif et merveilleux nous apparaît mentalement, nos perceptions sont à l’affût, les sens sont aiguisés, la sensibilité exacerbée, et le basculement s’opère, c’est un jaillissement, tout vient, les phrases naissent, coulent, se bousculent, et tout est juste, tout s’emboîte, se combine et s’assemble dans ces ténèbres intimes, qui sont l’intérieur même de notre esprit. Here, at the very heart of urgency, everything comes easily, floats free and lets go; actual sight is of no more use to us, but the inner eye widens, and a fictive, fabulous world appears in our minds. Our senses are alert, our perceptions heightened, our sensitivity intensified; a tipping takes place, a gushing, and out it all comes, sentences are born, flow, fall over each other, and everything is right, everything works out, everything gathers and fits together in this intimate darkness that is the inside of our very minds. Apparently there was too much falling over of sentences for this translator. The deadening is hardly unique. Ironically, in “Patience,” when Toussaint sets the stage slowly, “At the table, a bit embarrassed,” his translator now wants it all at once, “A bit embarrassed at the table.” A perfect example of the période coupée, “Tout importe, la condition physique, l’alimentation, les lectures” (essay three), becomes more conventionally, “Everything matters: physical fitness, diet, reading.” Toussaint tells us in “The Ravanastron” that it is the form of a sentence, not its meaning, that concerns him, but the translator seems not to notice. Gauvin’s ear for English idiom is likewise imperfect. What should plainly be “how the devil” (“comment diable,” essay six) is given, bizarrely, as “sweet Christ.” Subjects and objects come and go, as when “that I can attest” (“que je peux certifier,” essay 10) becomes “can attest,” and “which allowed one to picture the furniture” (“qui permettait de se représentait le meuble,” essay three) becomes “which allowed readers to picture it,” though not the “it” that concludes the sentence — one antecedent the word, the other its referent. In general, it is difficult to avoid the impression that the translator’s English isn’t quite up to Toussaint’s French. Toussaint is an author from whom to pick and choose, and it is the third part of Running Away, with its inimitable evocation of unspoiled Elba, that forms an ideal companion to the essays in Urgency and Patience. Unlike his oddly unmentioned master Thomas Bernhard, whose typical scenarios recur repeatedly in Toussaint’s novels — the academic who cannot finish his book, middle-aged men taking refuge in houses and routines, or again escaping family in restorative Mediterranean locales — Toussaint’s essays suggest a markedly more sensuous tone than his often austere fictions. Whereas Bernhard’s forays into autobiography get no sunnier than recollections of bureaucratic prize-giving ceremonies and a five-volume memoir of incontinence, Nazism, and chronic intractable tuberculosis, Toussaint plants radishes, enjoys hotels, reads Proust, and extols the virtues of armchairs and private libraries. Toussaint has fun. He rarely seems far from the Tuscan archipelago, reading Proust in Barcaggio, Corsica, making up a hotel in Venice, thinking of one in Portoferraio, writing on his MacBook Pro in a large room, in Erbalunga, Prunete, Cervione, Corte. Wandering in Italy near the end of his life, Friedrich Nietzsche once urged, lapsing into French, “Il faut méditerraniser la musique,” and while there are warm northern interiors and dark comfortable apartments in Toussaint’s reminiscence, it is the suggestion of the Mediterranean that lingers here, fertile in dry soil yet, the orchards of Médéa, deep blue Corsican rosemary, hills of fragrant maquis, far from Brussels and Berlin. Dylan Byron was born in New York and still lives there. I have been reading restlessly all day today. In bed, on the couch, at the restaurant, at the dining table. I woke up and I finished the last twenty pages of the first movement of Anthony Powell’s A Dance to the Music of Time. Without once resorting to poetics or philosophizing, these three volumes managed to touch on so many true things about humans, through upturned sugar bowls, motor car accidents, and comical overcoats. It was magnificent to go to Mrs. Andriadis’s party, which I had to hurriedly leave before I was connected to the agitated Mr. Deacon, who dropped his armload of “War Never Pays!” pamphlets as he pursued Max Pilgrim down the stairs. But as that first movement came to a close, I felt some relief that I was temporarily cut off from Jenkins, Widmerpool, Templer, and Stringham – delicious, Britishy-British names, all of them – until I would be able to get the second movement. I needed a break from so thoroughly living other people’s lives. I turned to The Archivist, by Martha Cooley. I bought it used at Kultura’s Books, near Dupont Circle, and I did not have high expectations because I had seen the book before, disliking the cover and for some unclear reason, the title. But it was the only book on my bookshelf that seemed an antidote to the hectic pace of the pre-WWII British society that had absorbed me for so many weeks. The Archivist was elegant and it shot me through with poetry. No light under my fingers. Where the grey light meets the green air. Although a critic on the back cover calls it a “literary detective story,” the story of archivist Matthias, his relationship to a wife he has to commit to a mental institution, and his safeguarding of a collection of not-yet-public Eliot letters is more a poetic love story. The way Matthias describes meeting his wife, Judith, is irresistible to any romantic who loves words and fancies intellectuals. He meets her in a jazz bar, where she is reading a book of Auden poems. He asks her which poem she is reading and she hands him the open book to read where her finger points. I love this scene for its uncute meet-cute quality, for its spare but punchy dialogue. At times the book, through Ondaatje-esque short sentences and heavy pauses, is too weighed down by Judith’s depression and Matthias’s detachment. They struggle to maintain their marriage as she becomes violent and obsessed with events following World War II. I grew fidgety in the middle, where the book became the diary that Judith kept while at the mental institution. Matthias and his post-Judith dealings, along with his narration, were more compelling to me. Still, each character is intelligent and lean enough that I forgave them for exploiting my weakness for those Ondaatje-esque short sentences and heavy pauses. But the real value of the book is its ardent advocacy of poetry, and T.S. Eliot’s poetry in particular. If you were ever forced to read “The Love Song of J. Alfred Prufrock” in high school and you fell in love with those words, then The Archivist will compel you to read them again. And after the all-absorbing society of Powell, after his truths distilled in teacups, after the skirts that trail along the floor, I found a different kind of pleasure in Eliot’s painful, beautiful questions and contradictions. I end my day full, in quiet. Rather than confused or scattered, Leah is lonely. Like everyone else I know, she is inconsistent and haphazard as she grapples for a story arc that will help her life make sense. It sells Middlemarch short to call it a novel of manners, although if viewed from just one angle it is. The novel describes the precisely ordered life of the eponymous village in feudal England, where every resident can be placed on a grid according to his annual income and the quality of his lineage. There are characters with small parts in Middlemarch, but no minor ones, so fully drawn are all of George Eliot’s creations. Principally the story concerns the life of Dorothea Brooke, a young and beautiful women of the upper class whose spiritual discontent leads her astray in marriage. There is also Tertius Lydgate, a cocky and ambitious doctor come lately to town, and Mr. Bulstrode, a new money banker with a mysterious past. Each chases love, money, and respectability in proportion to his needs and finds that the strictures of society, even more than the dictates of his conscience, shape the person he will become.In the middle of all this stands Eliot, whose presence is unmistakable as the energy that makes this fictional world go round. Writing of one character who has just lost his temper, the narrator says, “Will was not without his intentions to be always generous, but our tongues are little triggers which have usually been pulled before general intentions can be brought to bear.” This is typical of the way Eliot annotates, observing wisely on the fraught behavior of men, like the angel in It’s a Wonderful Life who tells George Bailey all about his life. James Wood, in How Fiction Works, called this perspective “authorial omniscience,” and it has the tendency to feel antiquated to us, a relic of a simpler time when the whole world might be understood according to such strict and unvarying codes.There are, in any story, always two competing forces, an individual’s will and social prerogative. When the two are held to be fixed and immovable, you get the best melodramas, like Romeo and Juliet. It’s a simpler class of story, one we respond to but no longer really believe to accurately describe things as they are. On the other end of the spectrum you have today’s conditions of storytelling, where neither individual identity nor the social order have any fixed anchors, resulting in all manner of existential confusion when the two mix together. Middlemarch, however, exists somewhere in between and the result is as pure and exacting as ballet.About halfway through the book, as a husband and wife contemplate the suitability of a young man for their daughter, Eliot writes, “A human being in this aged nation of ours is a very wonderful whole, the slow creation of long interchanging influences.” It is just that interchange of influences that Eliot sketches in Middlemarch and she does so with a fluency for human behavior that is quite often breathtaking. Take for example this small scene, describing the Vicar Farebrother after a brief interview with the eligible Mary Garth:As the Vicar walked to Lowick, any one watching him closely might have seen him twice shrug his shoulders… The Vicar was holding an inward dialogue in which he told himself that there was probably something more between Fred and Mary Garth than the regard of old playfellows, and replied with a question whether that bit of womanhood were not a great deal too choice for that crude young gentleman. The rejoinder to this was the first shrug. Then he laughed at himself for being likely to have felt jealous, as if he had been a man able to marry which, added he, it is as clear as any balance-sheet that I am not. Whereupon followed the second shrug.Here, Eliot is able to slow the world down enough to capture not only that the Vicar would shrug twice, but exactly why he would do it. The resolution with which she is able to observe her characters reminds me of great baseball hitters who see in slow motion what appears to the rest of us to be impossibly fast. Such is Eliot’s ability to dip into the torrent of human experience and master it.As commanding as Eliot’s view is, it is not static. Her central characters – Dorothea, Lydgate and Bulstrode – live contingently, always on the edge of transformation. Throughout the story they come to have a keener understanding of their own desires, a process of self-understanding that occurs through dialogue with other characters and the unerring rebound of the social order. Society itself is fixed (although Eliot does critique feudal landholdings and insincere religiosity) and in this, Middlemarch describes a world that is no longer ours. But the dialectic of her characters is timeless. Dorothea tests her spiritual longing against an unexpected passion. Lydgate wrestles with his professional ambitions matched against a wife who would seem to spoil him at every turn. Bulstrode struggles to reconcile his religiosity with more base urges, a desire for money and a fear of shame. As the characters try and evolve they arrive at inexact and unintended places. But that they do is not an indictment of the rigid social order. It is instead an exposition of human frailty, of our inability to know our own desires let alone to conquer them. Far from just a novel of manners, Middlemarch is a monument to the fraught lives of women and men. It is, quite undeniably, great.